FriYAY ~ Roses and Rain Boots . Hey y'all, happy Fri-YAY! 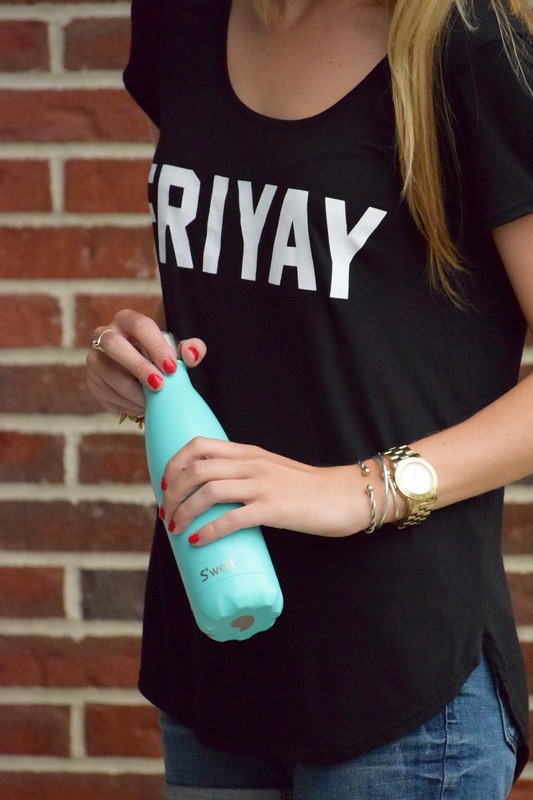 I am so happy the saying, FriYAY, is officially a thing now. As I once read, "Life should not only be lived, it should be celebrated," in my opinion that means we should start celebrating with the little things, like celebrating Friday's. And what better way to dress that way. Remember, you have to dress how you want to feel. This outfit defines my weekend vibes & summer uniform. First of all, can we talk about how difficult it is to actually take a jumping shot! Now this could just be a #laurenstruggle, what my friends use to describe the daily events that are continuously struggles for me, but really there is so much to think about! For starters, my boyfriend was telling me "you are barely jumping, get some air." Then, my shirt kept flying up, I have to smile, while at the same time, trying to keep the hair out of my face! Are. You. Serious. I've even included a bonus picture of me laughing hysterically trying to get ready because it really was such a fun shoot! Now that we have talked about the elephant in the room (in case you forgot, it's the reminder that blogging photos are not always as easy as they appear) let's talk about how comfortable this shirt is from Francesca's & the best part... it is under $20. Are you clicking on the link to order yours now? Good call. I am loving denim shorts this summer. I've expressed before my concern about shorts being too short. Then I decided that I am young, not yet 30, so now is the time to embrace my youth and yes, that means wearing short shorts. Lastly, I have been using S'well bottles for over a year now and highly recommend them. Not only are they practical by keeping your beverage cold for up to 24 hours, they are super cute too. My dad always tries to discuss practicality vs. style with me. I can recall not wanting to wear my bike helmet when I was younger because it didn't match my outfit. As a result, I knew S'well bottles were a keeper when we both agreed they were practical & stylish, the only thing he would disagree on is the price tag. I hope y'all enjoyed today's post and have a fantastic FriYAY! Oh & if you like what you see be sure to click the red "Pin it" button of the upper left hand corner of the picture and save it to your pinterest board! 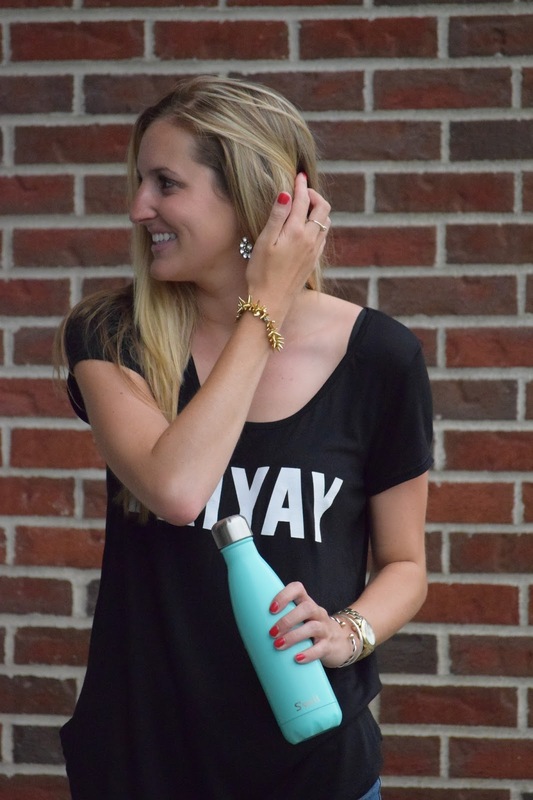 I love that water bottle! I have to get one for a trip I'm taking and this looks like the one I want! That shirt looks so good on you! I LOVE Francesca's! It's my go-to store :) I'm so excited about this link-up! Love the jump shot and love the shirt!